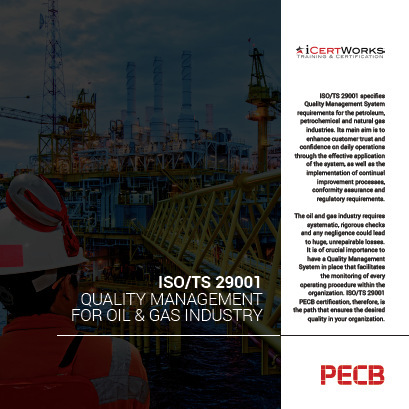 ISO/TS 29001 specifies Quality Management System requirements for the petroleum, petrochemical and natural gas industries. ISO/TS 29001 specifies Quality Management System requirements for the petroleum, petrochemical and natural gas industries. Its main aim is to enhance customer trust and confidence on daily operations through the effective application of the system, as well as the implementation of continual improvement processes, conformity assurance and regulatory requirements. The oil and gas industry requires systematic, rigorous checks and any negligence could lead to huge, unrepairable losses. It is of crucial importance to have a Quality Management System in place that facilitates the monitoring of every operating procedure within the organization. ISO/TS 29001 PECB certification, therefore, is the path that ensures the desired quality in your organization. ISO/TS 29001 certification (also known as "registration") is a third-party audit performed by a certification body such as PECB. Once compliance with the requirements of ISO/TS 29001 is confirmed, PECB issues an ISO/TS 29001 certificate to the organization. This certification is then maintained through regularly scheduled annual surveillance audits by the registrar, with re-certification of the Quality Management System performed on a triennial basis. For more information on ISO/TS 29001 Certification, please fill out the form on the right side of the page. Contact us about ISO/TS 29001 Certification! Looking for ISO 50001 Certification?